After a dramatic couple of weeks, the Moreauville, LA, board voted, on December 1st, to unanimously repeal the recently passed breed ban that targeted “pit bulls” and Rottweilers. At this meeting, the entire dangerous dog ordinance was repealed, not just the breed based portion. The only thing that remained at the time was the leash law that had been passed around 20 years ago. On December 8th, the board voted to implement Louisiana state dangerous dog law. This law is completely breed neutral and focuses on the actions of the dog and owner. The ban was passed at the request of several residents. It was not a consideration of the board until the request was made. There were multiple incidents with dogs menacing residents, and they finally reached their breaking point. I spoke to Mayor Timmy Lemoine about several incidents. One resident has their dog chained along the recently built pavilion and play ground area. Families hold birthday parties and gatherings there. Despite there being room on the property for the dog to not be in direct contact with that particular section, that is where the dog was chained. Chained dogs are often frustrated and act out, and this dog is no different. Several complaints had been made from residents fearing the chain would break. Officials attempted to speak to the dog owner, asking that the chain spot be moved back away from the common area, and were met with an extremely hostile response. It went so far that residents stopped using the public area out of fear of this particular dog. Another issue is a dog that is used intentionally to menace others. We are told a man would sit with his dog on the front porch of his house, near the sidewalk and tell his dog to “Sic ’em” as people passed. Mayor Lemoine had concerns about the way some dogs are being housed. There are dogs that are chained all day in the Louisiana summer heat, with no shelter and minimal resources. “A dog out on a chain like that all day goes crazy. Anyone would,” said Lemoine. The ordinance was copied from a neighboring town and, as such, the language and use of the word “disposition” was left open to interpretation. Mayor Lemoine said that the implications of the wording were not considered in depth in the passage of the ban and understands why it was interpreted the way it was. It was the understanding of officials that the ordinance, as written, was constitutional. They were advised by the town attorney that this was the case because it had not been challenged in the municipality it originated from. October 13th, the board voted to pass the ban. Mayor Lemoine said that they felt stuck. They had been asked to do this by their constituents and did not realize the implications of the law. Officials did not expect the ban to garner the attention it did. The story was featured internationally, created a circus of half-truths and opened the door to opportunism and fraud. Much of this attention can be traced to the images of Ohara Owens and Zeus. The media zeroed in on this aspect of the story because of the health problems of the young woman. They took the story and ran with it, taking the statement that the dog was “like a therapy dog” and turning it into Zeus actually being a therapy dog. Fundraisers were started by uninvolved parties, as well as involved parties for personal expenses, unrelated to this issue. Mayor Lemoine had to disable social media messengers because of threats. We have said this before, will say it again and will likely have to repeat it in the future. Threats of any kind are inappropriate, counter productive and absolutely unwarranted no matter what the circumstances. In speaking to Mayor Lemoine, several things become clear. This was a case of a lack of adequate research and wanting to act quickly on the request of residents. The intentions of the board were good ones. The behavior of the problem dog owners is abhorrent. At the risk of editorializing, if there is blame to be placed for the passage of this ban, that blame would rest squarely on the shoulders of those who are mismanaging their dogs and creating issues in Moreauville. It is clear that both Mayor Lemoine and the board care deeply about their community. “We are a nice little town and we don’t want people to have to fear,” said Lemoine. People readily ascribe negative intentions to officials who pass these laws but most often the intentions are not bad ones but more poorly thought out in the rush to act. It is easy to get lost in emotion and vitriol when dealing with matters of breed discriminatory laws. We cannot allow ourselves to get wrapped up in half-truths and rhetoric. We have to be open to honest dialogue about the needs of the community at large and build bridges with officials on all levels. Nothing is gained in threats and hatred and indeed we have more to lose by indulging in these paths. We cannot expect everyone to understand how breed based laws affect the community without a thorough and thoughtful conversation. For the most part intentions are good, though efforts misplaced and effects misunderstood. Mistakes are made. We must move past these mistakes and offer our help and expertise to officials who find themselves in the difficult position of having to draft a law they have no experience with. The simple solution is not always the most effective, but it is the most attractive. Lets offer help in place of hate, and build bridges to safer and more humane communities. 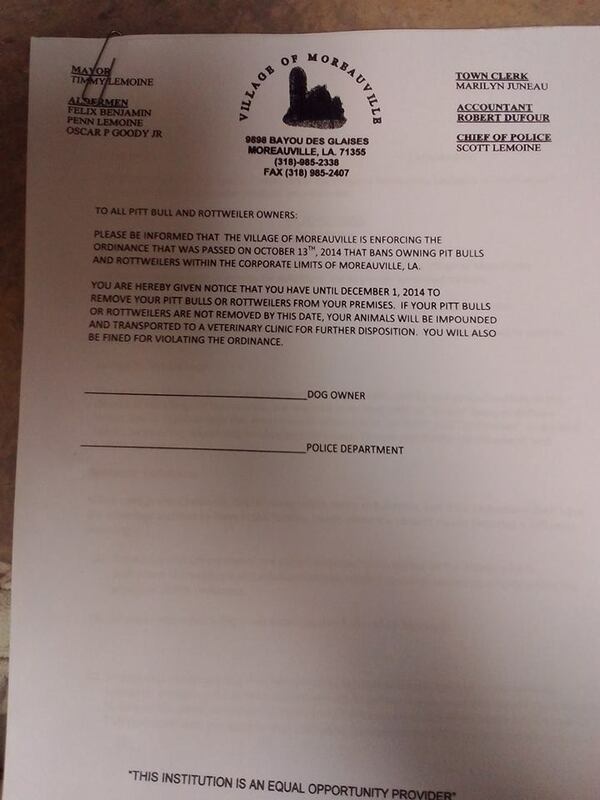 When the small town of Moreauville, LA, enacted a breed discriminatory law targeting “pit bulls” and Rottweilers, it was a quiet affair. The law, passed on October 13th, didn’t garner so much as a blip online. When officials sent a letter to residents demanding they remove their dogs by the first of December all that changed. As of this post, the story has been picked up by USA Today, CNN, The View, CBS affiliates, as well as garnering some international coverage and attracting attention from celebrities across the nation. Two petitions are currently circulating. One was started by the family of Zeus, who has become a media figurehead of sorts for the village’s breed discriminatory law. This petition has over 140,000 signatures. The other was started to focus on a general repeal and has over 10,000 signatures in one day. The attention that has been given to the issue of breed discriminatory laws by this story has been remarkable. It has been the media’s driving behind Zeus and his family that has brought so much attention to this issue. We must stress, however, that this is about more than just one dog. There are many other families that are at risk. It is good that there has been something to galvanize people into action, but we cannot lose sight of the larger picture. Unfortunately, the media has not yet picked up on the larger issues at play. I was able to speak with two other people who are effected by this ban and asked them each to make a statement. The goal here is not just to keep all the families together, but to repeal the ban and enact a law that will effectively address the issues the community is facing. This is about more than just one family. This is about more than many families. The fight against this law is about the loss of rights, due process, and a missed chance to help make residents safer in their community. Residents approached the council with legitimate concerns about certain dogs in the community. These concerns must be addressed. It is still unclear at this time if there is an animal control agency in town that would be able to enforce any law on the books. It appears that there are several veterinary clinics that contract with the city to house animals, in lieu of a formal shelter. City officials had included the name of a veterinary clinic in the meetings minutes, implying that this clinic would be tasked with the “disposition” of banned dogs. This clinic has made a public statement saying that they have not agreed to this, and that they do not support euthanizing dogs for the enforcement of a ban. Unfortunately, some people had taken it upon themselves to attack the clinic personally. This attack is unwarranted and counterproductive. We would like to take a moment to thank the clinic for making a stand against breed discriminatory laws. The latest reports coming from Moreauville state that enforcement of the breed discriminatory law will be put on hold until the council has a chance to meet and address concerns about the law. Thus far, officials who have been reached have been open to suggestions that would meet the needs of the residents who complained about issues in the community. The situation has been extremely confusing because the way the ordinance that has been circulating reads, there are restrictions but officials and the letter residents received clearly state that it is a ban. Some concerned residents attempted to obtain a signed copy of this ordinance, any general dog laws that are on the books, and the meeting minutes, but the town hall was closed. Thus far, these documents have been unavailable. Alderman Penn Lemoine said the board will have a special meeting to address the ordinance. He also said that they’ll likely overturn the law. The most productive line of action at this point is to offer solutions to the towns issues. We do not know if the discussion will continue at the next scheduled meeting, December 8th, or if the board will meet before then. We will update accordingly as information becomes available. It is imperative that residents attend this meeting to be heard. Officials have stated that they want to hear from residents specifically. The city of Camdenton, Missouri, heard a request to review their long-standing pit bull ban yesterday at the board meeting, along with a request to dismiss a citation for violation of the ban. The request was made by Misty Brown, a woman who bought a house in town 2 weeks before she was told her dogs must be removed from the town. The two dogs in question, Karma and Chaos, are registered American Bulldogs. According to Brown, before closing on her house, she checked with city hall and was told by an employee that her dogs were fine because they are not pit bulls. Despite doing her due diligence, despite American Bulldogs not being a targeted breed and despite the fact that the dogs did nothing wrong, Brown was cited under the ban after a neighbor complained about the dogs. Brown was ticketed and told that she had to get rid of the dogs by November 12th. The ban, which was passed in 1989, defines a “pit bull” several ways. The law has 2 separate and very different standards. The language an element of its breeding and substantially conform are used and both are different in what they mean legally. An element means any percentage of the specified breeds. Substantially implies over 50%. When Brown approached the board, she asked that she be allowed to keep her dogs because they are not pit bulls and their lineage as American Bulldogs is documented and provable. The board decided that because the registered American Bulldogs were determined to fit some of the physical description of a pit bull, that they are banned. The board seems to think that they can define a dog’s breed however they wish, based on 8 criteria that are extremely open to interpretation. Actually, not even 8, because a dog only has to meet 5 of the 8 criteria in order to be banned. Brown and her attorney asked the board to review the ban and the board was told by the city attorney that there is no reason to do so. It is clear the city attorney does not know much about due process, and is perhaps not the best to be advising in this situation, as the law is clearly flawed. Brown’s attorney stated that the ticket opens the town to legal challenge for a vague law, and it appears that they will be heading to court over the issue. This case highlights the exact opposite of what the pro-BSL lobby claims. They claim that only actual “pit bulls” are targeted under bans, and that other dogs are not because “everyone” can identify a pit bull. If papers don’t dis-prove a dog is banned, then there is no short-haired dog in the community that is safe. They also claim that dogs aren’t taken from their homes, that bans simply keep new dogs from the community. Clearly, this is not the case. Below is the check list used to identify dogs as falling under the ordinance. This gives a chance to see exactly how broadly these descriptions can be interpreted. – Head is medium length, with a broad skull and very pronounced cheek muscles, a wide, deep muzzle, a well defined, moderately deep stop and strong under jaw. Viewed from the top, the head is shaped like a broad, blunt wedge. – Eyes are round to almond shaped, are low in the skull and set far apart. – Ears are set high. Un-cropped ears are short and usually held rose or half prick, through some hold them at full prick. – Neck is heavy and muscular, attached to strong, muscular shoulders. -Body is muscular, with a deep, broad chest, a wide front, deep brisket, well sprung ribs and slightly tucked loins. -Tail is medium length and set low, think at base, tapering to a point. -Hindquarters are well muscled, with hocks set low on the legs. -Coat is a single coat, smooth, short and close to the skin. f. Any dog which has the appearance and characteristics of being predominantly of the breeds of Bull terrier, Staffordshire bull terrier, American pit bull terrier, American Staffordshire terrier; any other breed commonly known as pit bulls, pit bull dogs or pit bull terriers; or a combination of any of these breeds. The penalties for violation were severe, with fines of up to $2,000 and up to 179 days in jail. This ordinance was rare, in that it included the reasoning for the original passage of the ban. “1. That as a breed of dogs, all pit bulls are inherently dangerous. 2. That the possession of pit bulls within the City poses a significant threat to the public’s health, safety and welfare. 3. That numerous instances of attacks by pit bulls have occurred against members of this community and attacks by pit bulls in surrounding communities have resulted in serious injuries. On November 13th, the city council approved the final reading of an ordinance to repeal the breed ban. The issue was originally raised at a previous meeting and the city took on the task of investigating the issue. Topeka, Kansas’ dangerous dog law was selected for review. The council notes mention Topeka’s breed neutrality, and the issues they had found with their former breed discriminatory law and the cost to tax payers. Topeka had a breed discriminatory law that was repealed in 2010. It makes sense that the Spring Hill Council would look at the information from there, considering that Topeka had a committee that spent substantial time and energy reworking the animal control ordinances. The breed neutral law goes into effect after its publication in the local news. The new law will prohibit any dog that is declared dangerous, based on the actions of the animal, and not it’s perceived breed.